If you are doing business or have personal interests in Ecuador its important to know they have changed the document Apostille, Authentication and Legalization process in Canada. You may have been asked to provide documents using this method for personal immigration or corporate reasons, whatever the purpose your document must follow the correct process in order for it to be accepted in Ecuador. To help with the first step of authentication as Canada’s first provider we are able to speed up the process for you saving up to 25 business days. Our expert consultation also ensures that your document will be authenticated guaranteed. Once we have authenticated your document with Foreign Affairs Canada here in Ottawa your document is ready for legalization at the embassy or what is called Apostille in Ecuador. 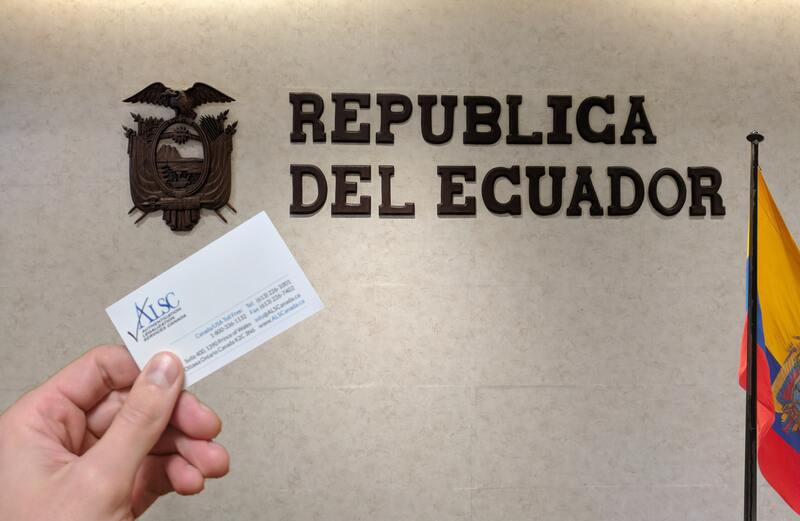 Our help allows you the confidence that your document will be legalized the first time at the Embassy of Ecuador also located near our office in Ottawa. Once we have completed the two step process your document will be accepted as the equivalent of an Apostille in Ecuador and be ready for official use. Need to Apostille, Authenticate and Legalize your personal or corporate document for Ecuador we can help contact Authentication Legalization Services Canada.